Even if it has been done to death, well, I’m not different from people who succumb to the nixie charms. I have liked the effect of this glowing neon once I saw it for the first time on an old HP instrument. There is nothing unusual in the story I will tell, many had already and many will have this adventure. Here is my personal experience leading to this tiny nixie clock. Yes. Yet another clock. This technology used to display numbers can be fascinating. Especially if we replace the story at a time when it was not trivial for an electronic device to display digits. At least not as easy as it is now on displays such as the one you are reading this. And this (hi)story is very well detailed here. Of course, Wikipedia has a nice article as well. What appeared challenging to me was first to tie from 170V to ground the cathode of the digit to glow. But of course, this problem was solved when nixies were used. To practice, I got nice little tubes, the IN-17. They are sufficiently common to still be affordable. Switching the high voltage of the 10 different cathodes can be done with old chips such as the K155ID1. It’s an easy to use chip in my opinion. Just a BCD decoder with high voltage capability. Still it consumes a lot, but they are a bit more practical than transistor and multiplexing. However, I still need one chip per tube, each of them has 4 logic input. I then used addressable latch chip that were lying there, three 74LS259, to control everything with 5 micro-controller output. For the rest of the design, I switched to more modern electronic components. I used a PIC16F micro-controller to drive the latches and decode the time from a dedicated DS1307 RTC chip. Two buttons to increment the hours and minutes and we’re almost done. Not without some wire-mess of course. What remains is the high voltage power supply. I used a 12V to 170V module in the IGG1-64×64 display, but this time I would prefer to have it from the 5V of an USB charger. There is plenty of 5V ‘nixie power-supply’ over eBay, but Mark Smith from https://surfncircuits.com/ did really a nice job to optimize his design and make it open. So, I reuse his work and ordered directly his board from Oshpark. Even if it’s an exercise, the result deserves a case. I played a bit with Fusion360 and try to make something a bit retro. As the numbers within the tubes are quite deep compare to their size, the vision angles are a bit limited. That’s the reason why the front panel can be adjusted. The small neon bulbs used as separators don’t glow exactly with the same color of the nixies, fortunately an orange filter equalizes the tones. The case is printed with PLA. What you see in the picture on the left is a board found in a trash container. No case where there, but I noticed some tubes. Unfortunately one of the 8 was broken, but it means 7 were spared. Looking closer, I found the keyboard aside, and on the board, the brand “Walther” was engraved. 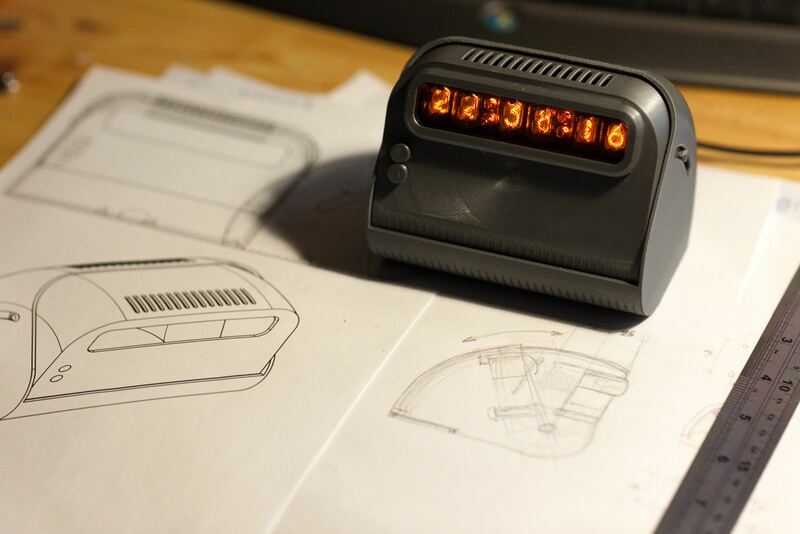 It was a calculator (Walther-ETR2), and the display is made of small nixie tubes. I tried several time to bring it back to life, without success. And same story to find a replacement tube. These tubes are NEC LD-8007, and seems to be part of the smallest ones. Maybe it explains their rarity and the fact I didn’t success to find a replacement one. So I thought I cannot let them lying and taking the dust (as so many stuff in what I cannot call an office anymore, let’s call this room the lab’). I had several ideas to use them, but I stick to simple and start a new clock. In order to make something decent and correctly scaled with the tube size, I would like to make something small. I should look for more modern solutions. Besides being small, there are few features I’d like to achieve. First is reusing the Mark’s efficient USB to 170V power-supply design. Then it would be nice to have wifi connectivity, allowing setup without button through a web page and automatically get the time with NTP. I discovered the ESP32 module and finally decide to have a look on the Arduino platform. I tried different editor/IDE, to finally start to make something useful with VScode plus the platformIO plug-in. The Microchip high-voltage chips, even if it’s oversize for this application, simplifies and reduce the component number. Actually, these chips would allow multiple digit to be lighten at the same time. Not very useful for a clock and it would require a resistor for each of the different digit of the tubes (the 60 cathodes in total), instead of one resistor per anodes (6). As many people already did, I used two HV5522, they are 32 bit shift register with high voltage open drain output. The counterpart of these chips is they need 12V for the power and logic signals. I’m more and more efficient now with Kicad, too bad I had just finished when Kicad5 was released. You can find the schematics bellow. For the PCBs I made a stack of two boards. I could then limit the final size of the clock. 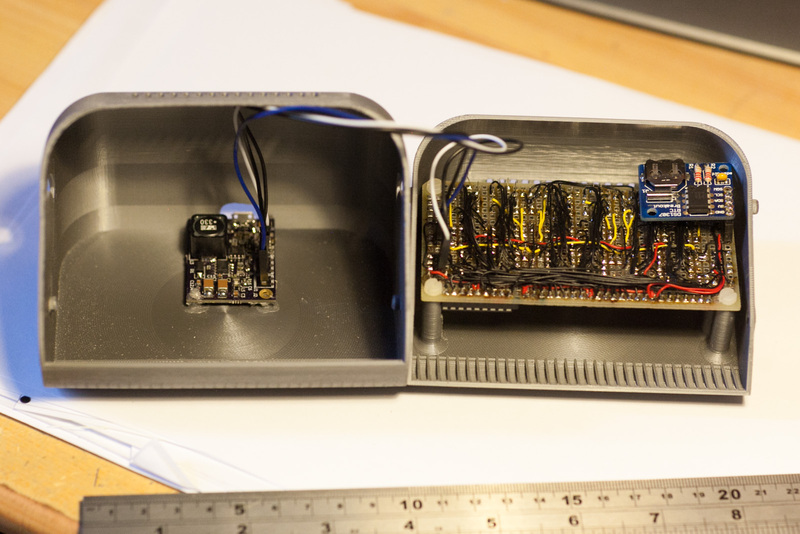 The width is mainly determined by the ESP32 module, and the length is set to have roughly the same spacing around the tubes. To limit the height, I’ve placed the tallest component, which is the 33uH coil from the 170V power-supply, in a hole through the board. On the first try with all the tubes, the 170 voltage dropped quite low, enough to make the numbers barely glowing. After some debug, it seems that putting the components on both sides adds some parasites/cross-talk on the current limit line of the UCC3803 chip. Fortunately decoupling capacitor seems to solve the problem. I’m still not 100% sure of the issue, but now the voltage stays around 160V. Everything could be left naked, or hidden in a case. Again I played with Fusion360 and I tried to find an elegant way to enclose these 3 boards. I ended up with three parts that are fixed in a sandwich way with the PCB, everything fixed by the 4 tiny M2 screws. It should only add 2mm around the clock, with the same height. For the scale, the coins are respectively one swiss-franc, one euro, 10 penny, and quarter dollar. This entry was posted in Micro Controller and tagged 3D printing, arduino, ESP32, glow discharge, high voltage, HV5522, IN17, K155ID1, Kicad, LD8007, nixie, nixie clock, OSHpark, PIC16F on July 30, 2018 by pierremuth.